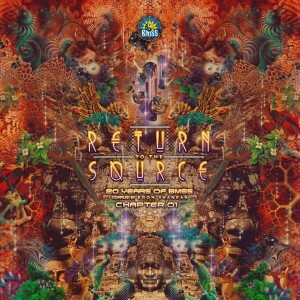 Celebrating 20 years of the BMSS family and ten years of BMSS the record label, "Return to the Source" brings together sonic synthesis from all corners of the multiverse. 17 tracks representing the mature tone of BMSS, which has evolved over the last two decades into a style that pays tribute to the source of our scene by disregarding trend and convention. An eclectic selection gathered by label manager and globe trotting DJ Boom Shankar to challenge standards that breed conformity and reflecting his own personal style that prioritizes story and flow over genre and BPM. The story told by this 20th anniversary release unfolds in two parts. The journey begins by taking you back to the source and the darker side of the Psychedelic spectrum. Chapter 1 revolves around the intense magnetic power of the moon. Defiant, relentless energy distilled into: one of the last tracks by the recently departed Hux Flux, new music by psychedelic pioneer Total Eclipse, Japanese production perfection from Majide, Triceradrops and his hybrid psychedelic Techno, Dark Nebula and Datacult`s re-imagined "Beyond that Door" experienced through a Gamma Goblin filter, the prolific PsiloCybian and masterful productions by the legend worthy Braincell, Imaginary Sight and Lucid Mantra. Their sonic wizardry is designed to reinvent and reconnect you as you embark on this epic odyssey through the underbelly of moon-time music. Clever re-interpretations of ancient Goa trance classics stand alongside the intensely psychedelic visionary art of Aashit Singh. His visual fusion of the old and the new creates a bridge between the past and the present where Plus 6 Masterings` full bodied analog sound gives each audible detail a clearly defined space. Unusual choices. New points of inspiration. A return to the past through the forward looking lens of the now. No rules. No limits.